Fred’s Heating and Air is one of the most highly respected mechanical contractors in the Omaha and Council Bluffs area when it comes to HVAC for commercial construction. We’ve worked with many general contractors over the years, and they know us for our exacting standards, timely project delivery, unmatched quality, transparency, and responsiveness. Trust Fred’s with your next commercial construction project. When you do, you can rest assured that you will be in great hands. The combination of our expertly trained installers and streamlined business operations allow timely delivery as promised, project after project. 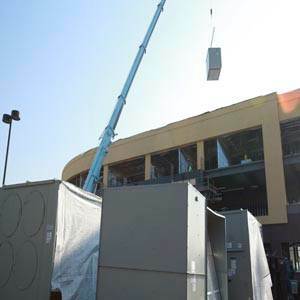 Call us today to learn more about how we professionally execute HVAC for new commercial construction. For nearly 30 years, Fred’s Heating and Air has been providing dependable, quality service to meet the heating and cooling needs of residential and commercial customers in Omaha and Council Bluffs. Fred has built his company on a foundation of integrity, honesty, and good old fashioned hard work. Our focus is on balancing cutting edge HVAC expertise with unmatched customer care. We maintain a BBB rating of A+ and have been fortunate enough to win the Angie’s List Super Service Award each of the last 5 years. This award is only given to 5% of all contractors on Angie’s List. We have the knowledge and expertise to service, maintain, repair, and install all types of residential and commercial heating and air conditioning systems. Call us to schedule your repair, tune-up, or free estimate today! We look forward to serving you.